Imagine, if you will, leaving Indiana at fourteen, by yourself, for one of the nation's elite boarding schools in Massachusetts. Over the next four years, you never distinguish yourself—not academically, athletically, or socially—though once you were the very definition of overachiever. Though miserable, you never return home, and you never do anything to salve the pain of staying. This is exactly the situation Curtis Sittenfeld creates for Lee Fiora in her best-selling Prep, a first person narrative style that is, in fact, a fictional memoir, told years later. 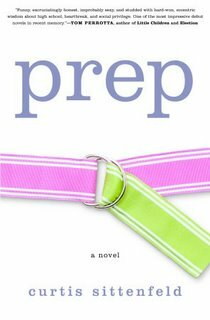 A masterpiece of teen angst, Prep sits on the same continuum as Hairstyles of the Damned (previously reviewed) but at the opposite pole. Not only is this the feminine perspective, but it is also the overly analytical introspection of a true introvert, which some might misconstrue as narcissism. Prep is a classic fish out of water story. Ault, the fictional boarding school Lee attends, is populated by the beautiful and the wealthy, and Lee, a scholarship student, is neither. When she arrives, her desire to conform, to fit in, causes a paralyzing anxiety from which she never recovers. Lee, the once outgoing student, becomes the passive receptor who cannot even muster the courage to be passive aggressive. Presented time and again with opportunities to do something, anything, Lee instead chooses to do nothing for fear of revealing herself to be a fraud. In the end, Lee's first love, Cross Sugarman, diagnoses Lee's problem. "'I'm just saying that—' His tone softened. 'That I bet things would be easier for you if you either realized you're not that weird or decided that being weird isn't bad.'" If only every teen could come to that realization. Conformity is the bugaboo of adolescence, but those who come through it without being broken by it, often have the most to offer society as individuals, not just cogs in the machinery. Article is good but it is not the case with every one. Students take admission in boarding schools and feel great change after the completion of the program. Excellent Christian boarding schools of USA provide superb education to the students and teach so many things during the academic program.